Albania, Austria, Aruba, Belgium, Bulgaria, Bahrain, Benin, Bermudas, Brunei, Belize, Canada, Congo, Democratic Republic of the, Congo, Switzerland, Colombia, Cyprus, Czech Republic, Germany, Denmark, Estonia, Spain, Finland, France, Gabon, Great Britain, guernsey, Ghana, Gibraltar, Guinea, Guadeloupe, Greece, Guinea Bissau, Croatia, Haiti, Hungary, Ireland, Israel, Italy, Jamaica, Japan, Republic of Korea, Lithuania, Luxembourg, Latvia, Morocco, Monaco, Martinique, Malta, Mauritius, Niger, Netherlands, Norway, New Zealand, Panama, french Polynesia, Philippines, Poland, Puerto Rico, Portugal, Reunion, Romania, Russian Federation, Sweden, Slovenia, Slovakia, Senegal, Togo, Tunisia, Turkey, Ukraine, United States of America, Jeunesse Global - How INSTANTLY AGELESS® work? SODIUM SILICATE & MAGNESIUM is an exclusive blend of two differentiated silicates which allow their combination in a draw together the skin. 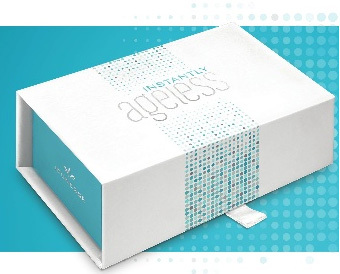 Instantly Ageless, Jeunesse Global - What is Argireline®? Argireline® was developed in the laboratory of Dr. Martin Rodbell. The biochemist had the 1994 Nobel Prize in medicine get because he found evidence that cells communicate with each other messengers. Dr. Rodbells finding was that in order to move a muscle, the neurotransmitter acetylcholine (ACh) is required. The more ACh is transported to the muscle, the more it contracts and the deeper will be the wrinkles. Argireline®, also known by the chemical name Acetyl hexapeptide inhibits the release of these neurotransmitters. It has the ability to greatly mitigate these nerve signals that the facial muscles are less active and can relax better. About 60% of the ACh's being blocked by Argireline®, making the skin finally has the chance to completely smooth. Argireline® is a chain of six amino acids that both the degree of existing wrinkles reduced, as well as a proven way their formation effectively counteracts. It is the only anti-wrinkle peptide with clinically proven effectiveness, studies and laser measurements have shown that Argireline® containing creams can substantially reduce the depth of wrinkles by up to 50%. It is used externally, has a soft, must not be injected and caused no toxic reactions. Argireline® is thus non-toxic, safe and gentle alternative to Botulinum toxin A (Botox *), and aims at the same folds educational mechanism, but in different ways.